Raise your hand if you’ve ever been personally victimized by stubborn fat. *Raises both of my hands and waves them around incessantly* Okay, great- so all of us here are on the same page. You’re dieting, working out, drinking water, and you even cut down on your post work margaritas twice a week (ugh), but you still have some of that junk in your trunk, goose in your caboose, or love in those handles. Enter: SculpSure– The world’s first FDA approved fat diminishing treatment. THIS IS NOT A DRILL, PEOPLE. SculpSure is a laser machine created by CynaSure (one of the top laser companies) with proven results to get rid of fat cells PERMANENTLY. First of all, this is not a weight loss treatment- it’s a fat reduction procedure. Your body has a certain number of fat cells. You will ALWAYS have this number of fat cells. Everyone and every body is different and that number doesn’t fluctuate. HOWEVER, those fat cells can shrink and grow depending on your diet and exercise habits. Remember that time I told you that you will ALWAYS have the same amount of fat cells? WELL, I LIED BECAUSE SCULPSURE CAN MAKE THOSE CELLS DISAPPEAR FOREVER. Think of your fat cells like balloons- they can grow and shrink depending on the “air in them” (aka your diet and exercise habits)- but they don’t just disappear. UNTIL NOW. Professional technicians at Petals Laser NYC “pop” your balloons. The area is treated by breaking down fat cells- PERMANENTLY. Every time you get SculpSure done, you kill 24% of the fat cells in that targeted area. My technician Sophia took her time to explain every part of the procedure to me in depth so I can fully understand what I was getting myself into. The treatment is the first FDA approved laser fat removal system and it’s completely noninvasive. There are no needles, no tubes, nothing that goes inside of you at all. Everything is done with lasers and DONE IN 25 MINUTES. That was the craziest part to me! Getting rid of my fat forever in 25 minutes seemed insane. She strapped a belt onto me with a few applicators that kind of look like vacuum heads onto my abdomen (you can get it done almost anywhere on your body FYI) and turned it on. She told me that I was likely to experience some pain- and I did- but nothing too bad! It kind of felt like cramps, varying from a hot to cold feeling back and forth. When the session was over I had zero downtime, no bruising, scarring, or pain whatsoever. It was the easiest “workout” of my life! Sophia told me that I can start seeing results as quickly as 2 weeks but it could be as long as 12 weeks to see full results and that even though 2 or 3 sessions are recommended, it’s not always necessary to do more than one. If I did wanna go again, I only had to wait 4 weeks in between sessions- which is a lot shorter than sessions in between laser hair removal! Plus, my second time around my total fat cell kills would be at almost 50%! She also told me that even though I was killing the fat cells, I probably wouldn’t see a huge shift in my number on the scale (because fat doesn’t actually weigh that much)- but I’d be seeing results in the way my clothing fits and how my belly would start to look flatter. All in all, this was a crazy awesome experience!! As I write this, it’s been a couple weeks since my treatment and I definitely have started to see SculpSure work its magic on me! 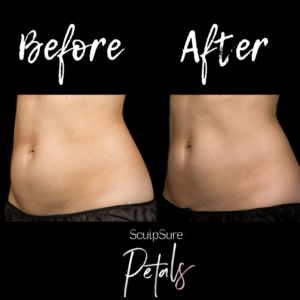 Price wise, Petals NYC SculpSure prices start at $350, which I think is a pretty great deal for something that takes away my fat forever. You can find Petals Laser Lounge in Lower Manhattan- steps away from Wall Street, or give them a call at 212-363-5555 for more info about everything that they do. Still want to know more? You can download an info-graphic and learn even more here.